Donegal manager Declan Bonner has hailed his team after completing their goal of securing promotion back to Division 1. A comprehensive 13-point victory over Kildare sees Donegal return to the top-tier, something which Bonner says they targeted at the outset of the year. "It's been a very positive league campaign," he told RTÉ Sport after their victory in Ballyshannon. "We've used an awful lot of young lads coming through the league and again towards the end of the league, a lot of the more experienced lads coming back in. "We set our stall out, we wanted to get back to Division 1 football. We've got our goal and we've one more match left now in the league final so we'll get ready for that tomorrow morning." Donegal never struggled throughout the game and they played with a strong wind in the first half, leading by 12 points at the half-time break. "I thought we kicked some really good scores in the first half and the way we managed the second half was very good," added Bonner whose side finished with an impressive tally of 1-20 against a Kildare side who finished with 14 men. "We kicked some really good scores into that strong breeze and I thought we were in total control." A league decider now awaits Donegal against Meath next Saturday evening in Croke Park. 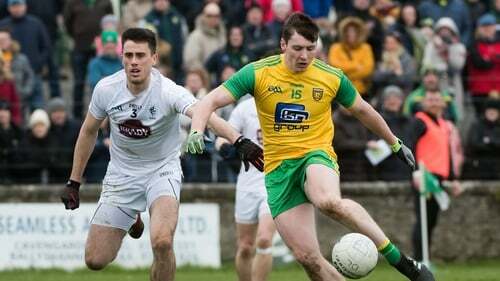 Donegal prevailed in the previous meeting between these sides earlier in the competition, and Bonner says his side are eager to pick up some silverware at the end of this Allianz League campaign before turning their attentions to the Ulster championship. "The target was to get back into Division 1 and to introduce a lot of young players throughout, and to have the experienced lads to come back in. "We've hit those two targets and still have a league final to play next Saturday night. We want to get that victory."